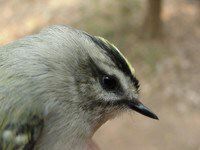 By early November in the Piedmont, many animals are seeking places to spend the winter, and it's not uncommon for homeowners to suddenly encounter small mammals, snakes, and other creatures that have come indoors to share the warmth. Thus, we weren't overly surprised this week to spy a Carolina Anole skittering across the hardwood floor in the living room of the old farmhouse at Hilton Pond Center. 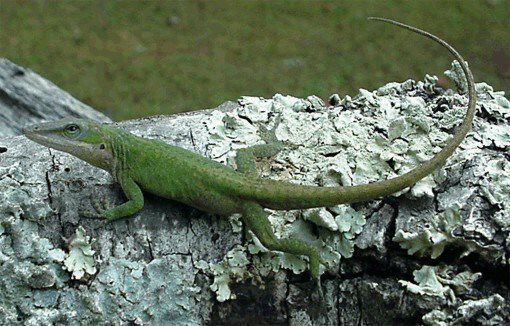 Sometimes anoles are incorrectly called "chameleons" because they change colors, but unlike a true chameleon that can match its background, Carolina Anoles (Anolis carolinensis) come only in two primary shades. One minute an anole will be bright green, and the next it has taken on a drab gray-brown appearance. These colors appear to be dictated by two factors: ambient temperatures or sexual behavior. When an anole is basking in the sun and warms up, it takes on a bright green hue, but on cool days the scaly skin is brown--even on sunny days. 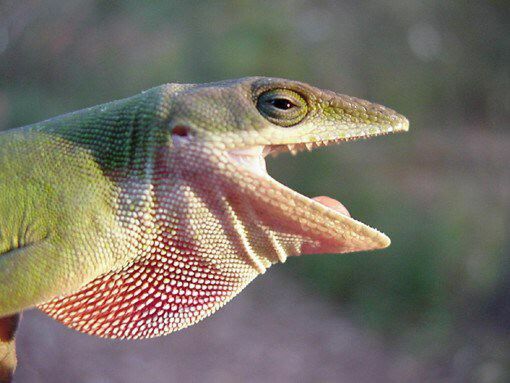 The skin also turns green when an anole is sexually aroused. The male Carolina Anole has one other color in his repertoire: a bright, cherry red that is exposed when he extends a thin finger of cartilage running from his chin to the bottom of his neck. The cartilage expands the skin to form a "dewlap" that normally appears white but, when stretched, reveals its red underlayer. The male uses this dewlap to announce his territory to other males and, at the same time, to attract the eye of a female that hasn't yet chosen a father for her offspring. Since one anole may defend only a few square yards, it's not unusual to see several males patrolling a large pile of stones or logs, frantically doing push-ups to show off their dewlaps to best advantage. If a male is really agitated, he may open his mouth wide in a menacing display, and then--if a neighbor doesn't retreat--attack and clamp down on a rival with his toothy jaws. Most Carolina Anoles hide from the weather under tree bark and old boards, deep inside brush piles, and in crevices between logs and stones. It's debatable whether anoles truly hibernate, since they often venture forth during warm spells from December through March. And, as we learned first-hand this week at Hilton Pond Center, some of them take advantage of cracks that lead inside peoples' heated houses to what must seem to anoles like a year-round tropical paradise.